For information on the Wildlife Rehabilitation Center located at the WHS Milwaukee Campus, click here. Pets surrendered by their owners make up the majority of the animals brought to the Wisconsin Humane Society. We also hold stray contracts with municipalities in Racine, Brown, Door and Ozaukee Counties, and receive animals transferred from the Milwaukee Area Domestic Animal Control Commission (MADACC). In addition, we receive animals transferred from other shelters. WHS is proud to say that about 70% of our adopted animals are from local sources. That’s more than 7,000 animals – more local animals rehomed than anyone else in the state. We are also proud that our capacity allows us to help save the lives of other animals – no matter where they were born – who would otherwise be euthanized at other shelters with fewer resources. How do you determine your adoption fees? Adoption fees for kittens vary from about $25 to $149. There is no fee at all for adult cats. Adoption fees for dogs vary from about $25 to $449. This variable adoption pricing allows us to provide quality care for all animals. The animals with higher adoption fees tend to be adopted most quickly; those higher fees help support the animals who need more care and are with us longer. Cats and dogs in our adoption program are provided with many services: spay/neuter surgery, microchips, collars, initial vaccinations, heartworm and/or other testing, behavior and medical assessments, and of course, nutritious food. They go home with a certificate for a free veterinary exam and cats and dogs leave with a bag of food. Many of the animals in our care need additional medical or behavioral support for a variety of conditions. Adoption fees do not cover our animal care costs, nor our other programming; donations from generous individuals, businesses and foundations support the majority of our work at WHS. And it's all locally raised -- there is no national umbrella group for animal welfare and we don’t receive general government funding. To learn more about the adoption process and our fees, visit our adoption process page. I can’t afford to treat my pet medically – can the Wisconsin Humane Society help? We wish we could provide financial assistance to people whose pets need veterinary care they can't afford, but we unfortunately do not have the resources to provide veterinary care beyond spay/neuter and vaccine services. Some clinics offer payment plans and there are some national resources that may be helpful to you. Can I get on a waiting list for a particular breed? Adoptions are first-come, first-served (as long as the match is a good fit, of course), and we do not keep waiting lists. The variety of dogs whom we have available for adoption changes daily and often includes purebred, as well as mixed-breed dogs. We recommend bookmarking our "Available Dogs" page and checking it daily to see who is available for adoption. Is WHS affiliated with MADACC? WHS is an independent organization, but we work with the Milwaukee Area Domestic Animal Control Commission (MADACC) on a nearly daily basis. We do not share staffing, financial resources or any administrative functions with MADACC, but enjoy working with them very closely to help Milwaukee’s animals. We do not have the jurisdiction to investigate abuse or neglect cases, but do want to provide concerned citizens with information on how to make an effective police report. All reports of suspected animal cruelty or neglect in Milwaukee, Ozaukee and Racine Counties must go through the local police or sheriff’s department. If you see an animal in a life-threatening situation, please call 9-1-1. For more information on how to report abuse or neglect, click here. The Wisconsin Humane Society never euthanizes animals for reasons of space or time. All animals in our adoption program have as long as it takes to find a new home; there are no time limits in our adoption program. This is true for all our campuses. We do not use the "no-kill" phrase because we have found that it confuses people. There is no universal definition of “no-kill” that is understood by animal welfare professionals, and the general public, despite efforts of some groups to create such language. There are also “no-kill” sanctuaries and organizations that do not uphold humane standards of care, so “no-kill” is not necessarily an accurate indicator of humane or quality animal care. Where are your animal statistics? You can find animal statistics in our annual reports on the About Us page, as well as more detailed intake and outcome statistics on the Lifesaving Statistics page. Are you a chapter of the Humane Society of the United States (or PETA, ASPCA, etc.)? The Wisconsin Humane Society is not an affiliate or chapter of any national organization. WHS is a local, independent non-profit organization operating shelters in Milwaukee, Ozaukee, Brown, Door, and Racine Counties, as well as the Spay/Neuter Clinic in West Allis. Do all humane societies in the state fall under the direction of the Wisconsin Humane Society? The Wisconsin Humane Society (WHS) operates the Spay/Neuter Clinic in West Allis, and five shelters - the Milwaukee Campus, Ozaukee Campus, Green Bay Campus, Door County Campus, and Racine Campus. Other humane organizations around the state operate separately and independently from the Wisconsin Humane Society. What is your outcome decision making policy? When we receive an animal at WHS, we provide that animal with behavior and medical assessments. All safe, healthy animals are placed into our adoption program. Whether or not we can place other animals into our adoption program is determined based on several factors. These include the severity of the medical or behavior condition, quality of life, risk to other animals in our care, public safety, and the ability of a typical home to manage significant medical or behavioral issues. We work to treat and rehabilitate conditions ranging from food aggression and separation anxiety to heart conditions and fractures, but if we are unable to place an animal into our adoption program, we may explore placement with rescue organizations, barn cat programs, or other “non-home” environments. Additionally, we may offer to return the animal to the surrendering owner, if appropriate. When we cannot place an animal into our adoption program or find an alternative placement solution because of significant medical or behavior conditions, we consider euthanasia the most humane decision. This decision is always made with the utmost consideration of the animal’s quality of life. The procedure is conducted in a manner that is humane and respectful, and is performed solely in accordance with WHS policy and procedure, Wisconsin state law, and the guidelines set by the American Veterinary Medical Association and the Humane Society of the United States. Our live release rate in 2017 was 89% for dogs, 80% for cats and 85% overall. I can no longer care for my pet. Can I bring him/her to WHS for adoption? Some animals can find a shelter environment stressful, so we always recommend carefully considering all options before surrendering your pet. Be sure to tell your friends, family members, neighbors and coworkers that you need to find a new home for your pet. You’re likely to have positive results through this type of networking. We also have a virtual rehoming program through which you can list your animal on our website for free. If you do choose to surrender, an appointment is requested so we're better prepared for your animal's arrival. To schedule a surrender appointment at the Milwaukee Campus, please call 414-431-6102; Racine Campus, 262-554-6699; or Ozaukee Campus, 262-377-7580. Please have the following prepared: Submit an online dog profile or cat profile; bring photo ID to the appointment; bring any medical records; your animal should ideally be current on vaccinations, including distemper, rabies and kennel cough. Your animal should be social and easy to handle. Also, please note that we are willing to work around time constraints and will never turn away an animal in need. Do you provide private euthanasia of owned pets? Yes. We offer comprehensive end-of-life services. At their families’ request, we offer euthanasia for privately-owned pets who have become seriously ill or injured. Prices range from $20-$70 for small animals, cats and dogs. 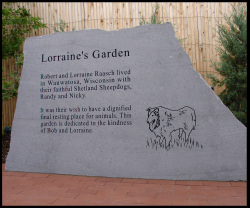 Cremation services, grief counseling and animal internment at Lorraine’s Garden at the Milwaukee Campus are also available. Please call for more information, (414) 431-6102 or visit our page dedicated to end-of-life services. Does WHS have paid staff? Yes, we have about 215 full-time and part-time employees—and more than 2,500 volunteers! I have a community service project due for my school; can I fulfill my requirement at WHS? Most community service projects are too short-termed to be fulfilled at our shelter, but outside projects, like organizing donation drives for items on our wish list, are often a perfect fit for projects that only require a few hours. Please see our student service project brochure for more information. I’d like to plan a fundraising event for WHS. How do I get started? The first step is to fill out our 3rd party fundraising form and check out our fundraising toolkit for a list of great ideas and guidelines for partnering with WHS. Did you know that 82.5 cents of every dollar generated goes directly to fund pet programs and services at WHS? We rely on donations to care for thousands of dogs, cats, and other animals each year. How do I change my address or remove my name from your mailing list? We are happy to help. Please contact the development department at ccarini@wihumane.org or 414-431-6119.